Pumpkin, a low calorie vegetable is rich in vitamin-A, vitamin-C and vitamin-E. Pumpkin has all essential nutrients needed for baby’s development. Pumpkin actually helps to boost up the immune system in babies. 1. Combine dhal and rice together. Wash and soak along with red chilly for atleast 1 hour. 2. Now, grind coarsely along with fennel seeds and asafoetida. 3. Add salt, curry leaves and chopped baby pumpkin. Mix well. 4. Heat a tawa. Medium the flame. Spread a ladleful of adai batter evenly. Add oil around the edges. 5. Turn the flame to high. Wait till it turns brown and crisp. Flip to other side. Medium the flame. 6. Once cooked, serve hot with coconut chutney and avial. 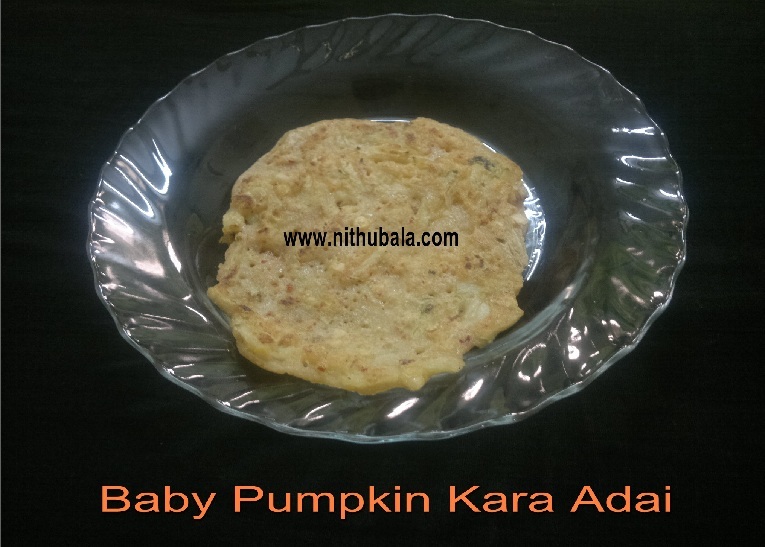 Healthy and tasty adai!! Love them with chutney any day.